There’s a big conference coming up next month, and the boss has tasked you with choosing the conference venue; an easy task, right? It is simple enough. However, venue choice can be the deciding factor between a good and a great event.While decor, food, and location are important when choosing between conference venues, there are a few more serious things that need to be considered and that your boss wants you to sort out. Certain venues only allow you to work with their in-house or contracted vendors. This may influence and limit food selection, entertainment, security and many other factors. Find out which vendors you are allowed to work with and whether they can provide you with what you need. To err on the side of caution, try use vendors with whom you have worked with before. If you are using a vendor for the first time, be sure to do rehearsals or tests of their services before the actual event. Make sure you understand the venues fine print and all the rules that you are bound to. Get everything in writing and ask for clarity on anything that you are unsure of. This is often overlooked or forgotten but is one of the most important aspects of choosing between conference venues. You need to find out what the rental policies, refund requirements, and any other unanticipated restrictions are. It’s also important to learn about any additional insurance policies you may be required to obtain, and any risk assessments either party may need to complete before contract signing. Ask the venue what security and evacuation policies are in place, in the case of emergencies, fire or other disasters that may occur. Be clear on what the site is liable for and what you are liable for and what the guests are responsible for. This is imperative as it can save you a lawsuit! Make sure that the venue is accessible to all (consider disabled and impaired people), that there are enough restrooms for the number of people attending, that the acoustics for the type of event is befitting and that the venue will be able to accommodate the layout that you require. Another thing to find out is if the venue provides tech support, setup support, and waiters. Make sure that you know what exactly is included and what you need to provide. Using a checklist of tasks to identify what they do and what you need to get done will make this task a bit easier. There are always some primary objectives of an event or conference; do you want your attendees to leave feeling inspired, educated, refreshed, engaged or thoughtful? Do you want them to have remembered the food, the decor, the ambiance or the advice that may have been given? The type of venue you choose will influence all of the above. When looking at this, ask yourself these three questions: (A) Why are we having this event? (B) What are we trying to accomplish while guests are with us and (C) What do we hope to accomplish by the time the event is over? For example, if you are having a technically heavy event, your venue must be able to provide you with screens, reliable wifi coverage, tech support and good acoustics. This sounds like an obvious one, but it’s not. We aren’t talking about the budget that you set yourself before planning the event; we are talking about those hidden costs that surprise you after the event. Be sure to find out what exactly the venue charges for; i.e., sometimes venue can charge extra for dishes, condiments that guests may ask for, parking for people who drive themselves to the event and more. Be clear on what is included and what are amenities you have access to. Like we said before, get everything down in writing and always ask when things aren’t clear. 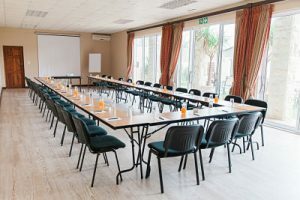 Going through these 5 points thoroughly and being clear and transparent with the conference venue will ensure that you make the right venue choice and blow the socks off your boss! Keen to impress your boss some more? Why not download our Ultimate Trends Guide here to learn more on how to host the hottest and trendiest conferences around!